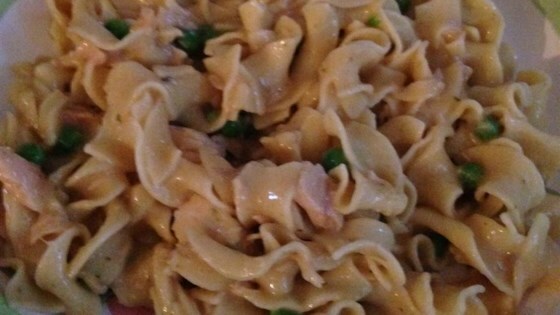 "Easy, creamy pasta and tuna combined with onion, peas, and red bell pepper." Bring a large pot of lightly salted water to a boil. Add pasta and cook for 8 to 10 minutes or until al dente; drain leaving about a 1/2 cup of water in the pot. To the pot of pasta, add tuna, celery soup, peas, red bell pepper, onion, and salt and pepper to taste. Simmer until hot. If needed, add more water or milk. Incredibly simple to make, this tuna casserole really satisfies. I would not cook this again, very flat..
Menwith Hill'er Back Home !! Yummy and easy. I especially enjoyed the crunchiness of the bell peppers - they added a nice dimension to this easy recipe.